We stumble upon two intertwined anniversaries on this New Year’s Day, 2014. With the Trans-Pacific Partnership (TPP) looming, a new trade pact based on the broken model of corporate globalization, we mark 20 years since NAFTA went into effect. The Zapatista uprising, timed to coincide with the implementation of NAFTA on Jan. 1, 1994, was not only a response to corporate globalization and changes to the Mexican constitution to privatize the commons, but proposed charting a new path forward for our global community based on autonomy, “true democracy, freedom and justice”. The arrival of Zapatista communities in Chiapas and EZLN on the public stage is 20 years old. Both entities are now old enough to vote (in Chiapas, only through direct, autonomous democracy and councils, of course). What kind of observations can we make of this coming of age? Personally, learning about the EZLN early on in my high school career (years after the initial 1994 uprising) forced me to examine my own place in the world and reflect on injustice, kicking off a political awakening that continues to evolve. NAFTA, as the Zapatistas and many other critics outside of the U.S. Congress predicted, has damaged on local economies in the U.S., Mexico, and Canada. The reduced trade barriers, protection of certain unfair, damaging subsidies and cuts of other supports, environmental destruction, job loss, exacerbated income inequality, disintegrating workers rights and wages, and many more negative impacts of NAFTA were not a “failure” of the trade model – it was an overwhelming success, doing exactly what it was designed to do. Family farmers in both countries and access to food that’s healthy for people and the planet have suffered as a result. The classic example is the dumping of subsidized corn commodities, lots of it genetically engineered, on Mexican food economies has resulted in the loss of locally adapted, indigenous landrace corn varieties, an important staple food. In both the U.S. and Mexico, large-scale, corporate farms have proliferated and consolidated land ownership, often at the expense of indigenous communities and family farmers. The Zapatistas, on the other hand, have continually reinvented themselves, adapting tactics to community demands and changing times, and staying relevant – if sometimes less visible on the global stage – up to today. We should take inspiration and refocus our movements for sovereignty, agricultural and otherwise, to stop the new specter of the TPP and the ongoing dirge of corporate globalization. Along with the armed EZLN uprising (a result of years of prior organizing), occupying towns, cities, and government buildings in the state of Chiapas and the state capital, San Cristóbal de las Casas, the Zapatistas created peaceful, autonomous communities based off values of freedom, justice, and true direct democracy. The images of armed rebels kicking down doors, on the advent of a new era supposedly bringing prosperity for all, was the shock to the system that helped start a vocal, organized opposition to the World Trade Organization, NAFTA, Central American Free Trade Agreement, and neoliberalism. The Zapatista’s political engagement and call for action echoed through the 1999 WTO shutdown in Seattle, the massive demonstrations at the WTO ministerial in Cancun in 2001, the social forums that multiplied across the globe, indeed even through the recent Occupy movement. Through the years they have had to nonviolently resist attacks from paramilitaries, and while continuing to create a new world in the shell of the old in indigenous communities in Chiapas and affect Mexican politics, they raise their heads to remind the world of the Zapatismo proposal for a truly just, anti-oppressive, local, autonomous alter-globalization. In 2005-2006, La Otra Campaña (“the Other Campaign”), covered the Mexican countryside in a “from below” model of political engagement and participation. Just over a year ago, at the end of the Mayan calendar, tens of thousands of Zapatistas occupied town squares across Chiapas – silently – to demonstrate the power and poise of the autonomous communities. So what happens next? What will we write about in 2034, as these entities turn 40? Another development over the last 20 years has been the diverse evolution of the local food movement – the number of very small farms have also grown dramatically. Amazing awareness of the need for small-scale, local agriculture, to cool the planet, protect natural resources, support local economies and jobs, increase access to healthy foods for all people, and much more has encouraged the proliferation of creative, locally adapted food projects – supporting a local, just food system everywhere between farm to fork. But there’s lots more left to do. Government surveillance and the squashing of anti-globalization movement after 1999, along with the dispersion of the movement with many people and organizations returning to work within communities in very tangible, important, “on the ground ways” (and recognizing shortfalls of not more clearly addressing racism, sexism, classism, and how we organize social movements), has created the need for a return to the barricades. Perhaps not literal barricades or kicking in doors, but with a new threat of the TPP on our doorsteps, we harness the energy and awareness of political alienation and economic inequality of the Occupy movement and hearing the continual call of the Zapatistas, finding the new, strategic barricades that need storming for effective change in our food system and economies. We must refocus on creating a visible, diverse tapestry of politicized farm & food resistance to corporate globalization and the oppressions that come with it – and amplifying, supporting and working with the many, many alternative economies and food systems being built successfully across the world. Oppose and propose, linking the new models we’ve all been building to the political, grassroots change we need. Whether stopping the TPP, supporting food and farm worker rights, and building food sovereignty everywhere. For a great review of social movements and popular resistance to globalization in the age of Zapatismo, read “The Roots Of Global Revolt: The 20th Anniversary Of NAFTA & Zapitistas” by David Solnit. 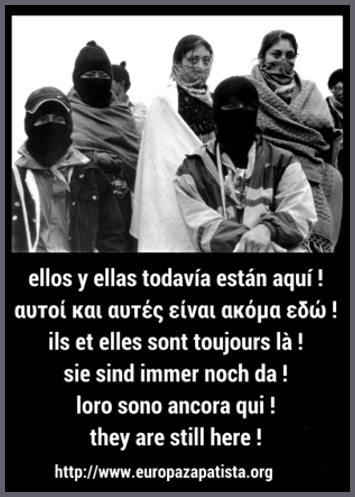 For more info and updates on the Zapatistas, check out dorset Chiapas solidarity blog, including a collection of 20th Anniversary posts, and RoarMag. For an analysis of NAFTA’s affects on agriculture after 20 years, check out “NAFTA at 20: State of the North American Farmer” and “NAFTA at 20” an extensive recent report from Public Citizen’s Global Trade Watch. Stay tuned for the Day of Action against the Trans-Pacific Partnership on Jan. 31! To get involved in Seattle, email us. Posted in Food Justice Blog Posts, News, Trade Justice Blog Posts and tagged EZLN, Food Sovereignty, NAFTA, TPP, Trans-pacific Partnership, Zapatistas.